Face is like a jigsaw puzzle of different features, which when combined together give the appearance aesthetic appeal. Even one piece out of place or proportion, can make the look unbalanced. The lips are a vital feature that sets off the rest of the face; when overly big, they can take away from an otherwise elegant appearance. 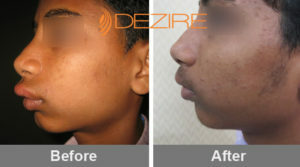 At Dezire clinic Delhi we offer lip reduction procedure at our state-of-the-art outpatient suite. The procedure is designed to bring the lips into proportion with the other facial features, accentuating the face instead of distracting attention. Our experts will tailor the procedure to fulfill your needs and desires, taking into account the form and dimension of other facial features. It is also possible to combine lip reduction surgery with other facial cosmetic plastic surgery procedures, such as chin augmentation, jaw augmentation or rhinoplasty or it can be performed by itself. The reasons for overly large lips can include genetic/race, congenital defects, an injury to the lips, as well as a previous and poorly executed lip augmentation. There are four zones of the skin surface of lip: hairy skin, vermilion border, vermilion and oral mucosa. The pink part on the lip is vermilion and the border just on top of the vermilion is vermilion border. The area of upper lip between base of nose and pigmented edge of upper lip is called philtrum. The upper and lower lips meet at the corners of mouth called angles of mouth or oral commissures. 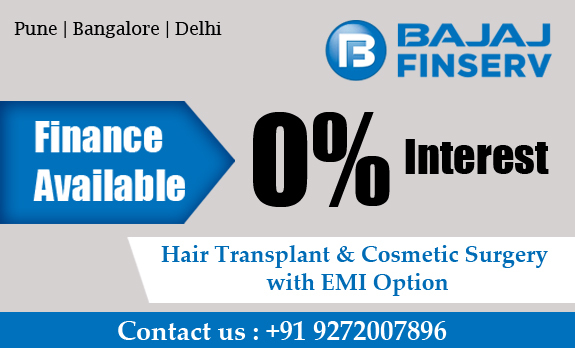 Candidates for lip reduction can be males and females who are in overall good health and have reasonable expectations of the outcome of the procedure. People who are born with large lips or have had a botched lip augmentation with too much silicone can make ideal candidates for the procedure. People born in certain ethnicities who have thick lips and people born with congenital defects like cleft palate also make ideal candidate. Victims of accidents or injury that need correction. Overly large lips can affect daily routine habits such as eating, talking, performing good dental hygiene and others. Often, children and adults with protruding lips are the object of teasing and ridicule which can contribute to poor self-confidence. 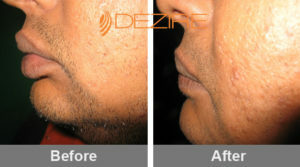 Now there is a solution at Dezire clinic Delhi. Lip reduction surgery is possible as both upper lip reduction or lower lip reduction. The lip area is first marked which will help the surgeon during actual surgery. In most cases Lip reduction procedure is performed under local anesthesia on outpatient basis. Intravenous sedation or general anesthesia might be used if you are undergoing multiple procedures, or if you feel more comfortable being unconscious during your procedure. During surgery, Dr Prashant Yadav creates a horizontal incision on the inside of the lip. He then removes a strip of excess fat and tissue from the lip before closing the incision with stitches. It takes about 2 weeks for full recovery from lip reduction surgery. Initially, there may be mild discomfort, swelling, and bruising; these diminish over the first several weeks following surgery. Temporary numbness or tingling of the lips is common. It is advised to keep your head elevated for the first few days, and refrain from any vigorous activities. It is best to consume soft diet for several days, while the lips begin to heal. Normally, patients feel well enough to return to work or school in two to three days. While lip reduction surgery is considered quite safe, there are some side effects of surgery that can be expected including pain, swelling, bruising, and redness in the treatment area. These side effects are generally very mild and generally dissipate within a few days of surgery. Since the incision is made inside mouth it is best idea to avoid eating acidic foods. Cost for your lip reduction surgery varies from patient to patient. It depends upon the amount of work that needs to be done. Please make an appointment at Dezire clinic, Delhi. On your visit personalised visit with, Dr Yadav, he will discuss with you all aspects of your surgery and give you the exact cost of your treatment.